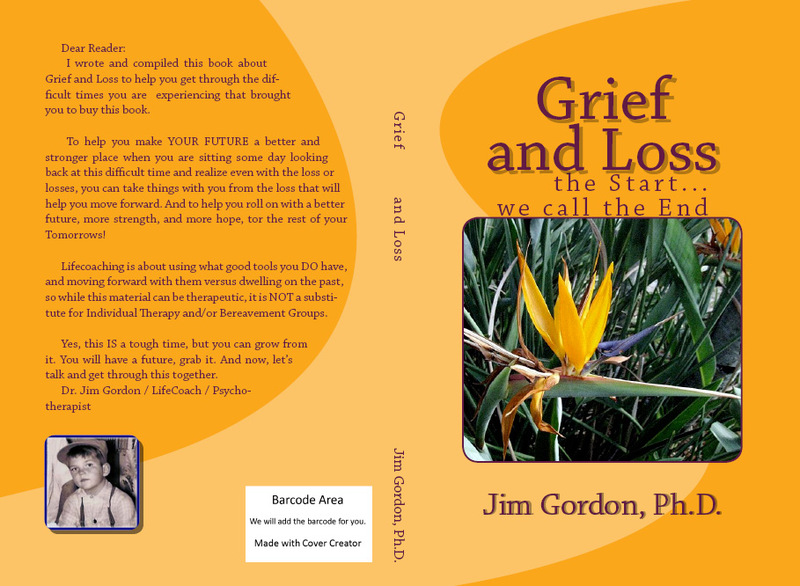 … you will find practical suggestions for getting through your loss. There are quotes, poems, and stories. I believe there is little sense in ‘re-inventing’ the wheel. Since man began, there have been losses from everything from fires to earthquakes to death. So much has been written about life-and-death over the years. Each religion has its own definition of death, and the afterlife, however they choose to view it. Therefore, most everything in this book presented has been presented before, in some form or another. The commentary and editorializing is from me, along with some wisdom I’ve garnered. The rest of the wisdom is from others who’ve written, talked, and survived losses themselves. Your survival and how to make peace with yourself, redefine your life and create the best future is our goal together. To help you find your best ways to get a better handle on your Life and take some of those Steps as you move forward from this difficult time. Loss is usually equated with death. The reality is that we suffer many losses in our lives. Those losses can include things such as loss of innocence, as we grow up and realize there may not truly be a Santa Claus or a tooth fairy. It can be realizing that as we get older there are expectations made on us, such as getting a job, taking care of a family, and paying bills. For many people one of the first traumas is that loss of your first baby tooth. We have all seen children who get somewhat panicked, and maybe not just somewhat but totally panicked, when the first tooth falls out and parents try so hard to assuage the child that this is just part of their normal growth. Children also tend to go through a period of time when they realize that the death that they have observed in their goldfish, hamsters, or other pets could also happen to mom and dad. Many a child has spent a traumatized night crying after experiencing the death of a pet, or a friend, and they want to be assured that mom and dad won’t be dying on the them now too. “Be aware of wonder. Remember the little seed in the Styrofoam cup: The roots go down and the plant goes up and nobody really knows how or why, but we are all like that. Remember, not all Loss is Death related. A major loss is the Loss of Innocence and Naivete. Such an occurrence is experienced by graduating from high school. For many kids, schooling – from pre-school to high school – is a time of camaraderie, spent with familiar friends who have grown up together, and now, for many, it means going off to a college in another part of the country, sometimes even another part of the world and meeting everybody new. Reality hits! Their family and old friends are not there to hang out with. Spending what is to be that first exciting weekend at the new college dorm, or apartment near the college, can be very sobering. It’s another way of cutting the umbilical cord, and forcing someone to grow. Yes, it is an ‘end’ of an era in your life, but the ‘start’ of your Future. This brings up a quick thought to share. In the 1970’s, the phrase, “Today is the First Day of the Rest of Your Life” took off as the buzz phrase for a while. I remember seeing it on patches on jackets and shirts back then. It was attributed to the founder of Synanon, a drug re-hab program with a dubious record – BUT the thought is appropriate not just for folks who end drug use and re-start their lives but for all of us and particularly those recovering from a loss. What is behind us we can do little about changing, but we can start to LIVE from here forward. Talking about Loss and Endings always sounds so final, and finding a way to ‘re-frame’ it is not easy. Recognizing that there are so many new starts in our lives is one way of de-demonizing the word Loss. Life is an ongoing progression of losses. When one reaches their 20th birthday, and realizes their teenage years are over, that can be a big shock to the system. And we all know that the milestones of turning 30, 40, 50, and Medicare age, are also times of loss. As those times are reflected upon, as we look back, it is usually about what we have or haven’t done, what we wished we would have done, and at some point in our lives, it is scary to realize that we have less time in front of us and behind us. That type of reflection, adds a new urgency to accomplish things. There often is that shock at those milestones, and the realization that we are mortal. MORTAL. A scary thought. While accepting that we are still alive, we realize there is an end to this journey. Which is why some religions have coined the phrase, “the birth we call death”. For many religions and beliefs, our time on earth is just a trial for the great afterlife, whether it be heaven, whether it be returning to Earth in a different form, or however it is defined by each belief. Remember, ending a career may mean it’s time for something new to happen for you. Ending a friendship with one person may mean the beginning of a friendship with somebody new, some wonderful new person who you might not have met had you stayed in your old rut. Please realize that nobody is saying that you shouldn’t feel bad about what happened, about your loss. Nobody is saying you don’t have the right to lament and feel angst over the end of your relationship, your friendship, your job, or the death of someone close to you. What we are saying is what you do with it and how you handle it from here forward is what’s going to be productive for you. I truly believe that change often produces growth. And just because a life is over, or a loved one has died, for the people left it behind doesn’t mean that everything is done. Or that it’s time to pack it in and become part of the Pre-Dead which is why we describe many retirement areas like Florida, Palm Springs and parts of Phoenix – as “God’s Waiting Room”! Sadly, many folks DO take that attitude, that Life is over after their spouse or partner dies, and many friends die, and they just hang out stoically awaiting their demise. It’s Better to Live ‘til you Die!